This is a classic comfort meal that when prepared with the right ingredients can be healthy and delicious! You can use ground beef in this recipe or easily substitute with ground turkey. I have also made it with a combination of the two! However, it is important to always purchase grass-fed and organic meats. We purchase all of ours through Butcher Box and have loved the service and products. I do have an affiliate program with Butcher Box, where I am compensated for any referrals that I send their way. However, I only work with companies that I truly believe in and love! If you are interested in giving them a try you can use my promo code AP10 to get $10 off and free bacon in your first box HERE! Typically served with mashed potatoes, I like to switch it up and serve with a cauliflower mash that makes the meal much lighter. This recipe has the added health benefits that come from adding in extra veggies and bone broth! I also love to pair this combo with roasted carrots or broccoli, so your plate is full of veggies! Another way to make this meal more fun if you have young kids is to make the meatloaf in muffin tins instead of one large loaf. You will need to adjust your baking time down to 25-35 minutes or cook until the internal temperature is 160 degrees. 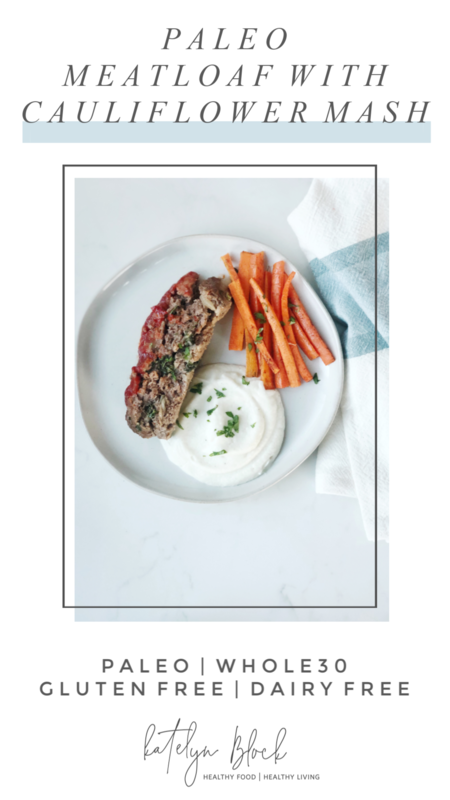 The mini sized meatloaf can also be great for packing in school lunches. Preheat the oven to 325 degrees. Heat the olive oil in a pan over medium heat. Once the pan is hot add in the onion and cook until tender, about 3-5 minutes. Next add the kale, thyme, salt and pepper. Cook a few more minutes to allow the kale to become tender. Next add the coconut aminos, bone broth, and tomato paste. Stir to combine and allow the mixture to simmer for a few minutes then remove from the heat and let cool. In a large bowl combine the ground beef or turkey, eggs, flax meal, coconut flour, and onion mixture once cooled. Stir to combine, but do not over mix or the meatloaf will become too dense. Form into a large loaf on a lined baking sheet. Spread the top with ketchup. Bake for 1.5 hours or until the internal temperature reaches 160 degrees. Serve with mashed cauliflower (recipe below) and roasted carrots or broccoli.